I once had a friend who was a dwarf. He didn't live in an enchanted house in the middle of the forest with a gorgeous nubile girl, or have six other friends who were equally lacking in stature. Neither did he burst into song at the drop of a hat, with his mining pick perched on his shoulder. No, he was just short. Extremely short. Steve was probably the tiniest person I've ever known, and what's more he didn't care. He was always first in the queue at the Snow White pantomime auditions (seriously! ); he was even involved in the British tradition of dwarf-tossing on several occasions, despite that this pastime appears to have been banned by the French. He had no qualms in choosing the vocabulary he used to describe himself. He wasn't "vertically challenged", or "physically disabled". He certainly wasn't "special" and would have headbutted, in the most sensitive area of the body, anyone who used that word to describe him. He was proud to call himself a dwarf. So why is it that the rest of the politically-correct world feels it has to take it upon itself to vanquish any word of this ilk from the English language? As this is, after all, a gardening column, I feel that it's important to call a spade a spade. Sorry, but I do. 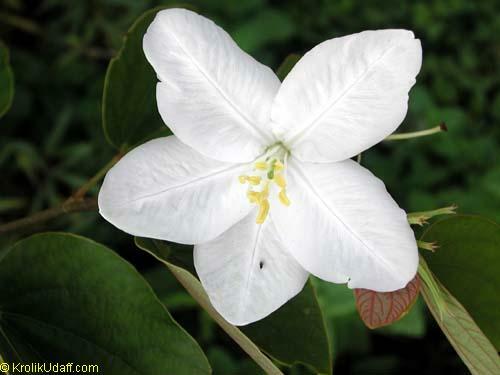 And speaking of gardening, it's probably about time I got to the point: the dwarf white bauhinia, or kaa-long in Thai. This is another of those plants that's just about everywhere in Phuket, but is innocuous enough to sit in the background and mind its own business. 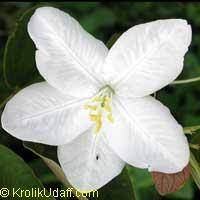 It's part of a much bigger group - the orchid tree family. 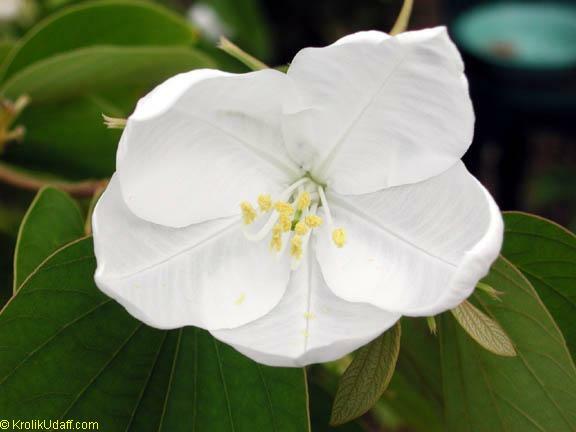 It's most famous relative elsewhere is probably the Hong Kong orchid tree, which bears the flower that is on the Hong Kong flag. This is a striking group of trees, with colorful flowers vivid enough to be used in making natural dyes. There are more than 300 species in the group, and some of them could be mistaken for orchids, although not this one, which doesn't show off in the way that its cousins do. 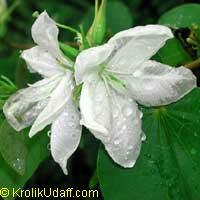 The dwarf white bauhinia is originally from just south of the border, in Malaysia. However, it's well suited to the Thai climate, and has become well-established here, too. 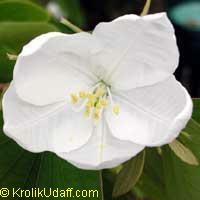 It's even been adopted by the southern coastal province of Satun as the provincial flower. This is a perfect little tree for places where you don't want anything wild to take over. It will grow no more than two or three meters, and won't take up much space or get in anyone's way. It really is quite inoffensive. 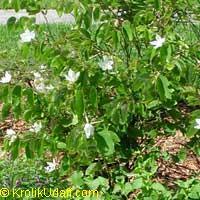 This unassuming plant produces fairly small, white flowers that look vaguely like snowflakes hanging on the branches, and it is sometimes called the snowy orchid tree. The leaves are easy to spot too, as they have a twin-lobed shape, a bit like an ox hoof. 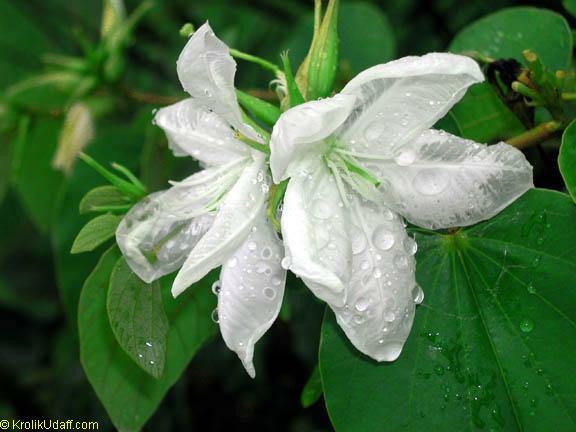 The bauhinia acuminata, as those lovers of Latin like to call it, grows enthusiastically in full sun or in partial shade. 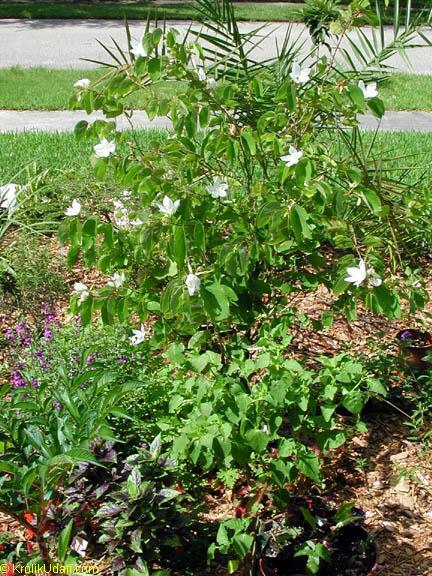 It can grow in most well-drained, moist soils. Even sandy soils are fine, but give it plenty of water. With the right conditions, it will flower almost continually - it doesn't seem to get bored in this regard. The little tree will develop several trunks over time, and has to be trained to grow from a single trunk if that's what you want. Personally I prefer the natural look - let it decide for itself what shape it wants to develop. The branches will naturally droop a bit as the tree grows, so will need a little pruning to keep it strong. Officially, this pruning should be done only after the blooms disappear, but given the fact that in Thailand they never do, it's difficult to know exactly when is best. The best advice I can give is to prune after your second beer - not too many to affect your judgement, but enough to gather a little enthusiasm for the task. Bear in mind that this tree is a dwarf at the end of the day, so will never actually reach the dizzying heights of some of its taller relatives. Like many of its human counterparts, it's probably quite happy that it's a dwarf. This one's a bit more difficult to toss, though.